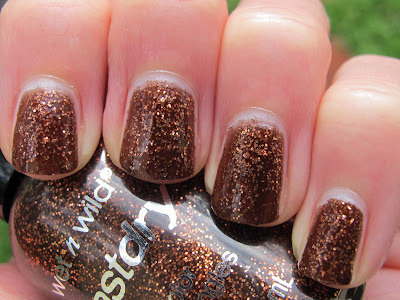 Never Enough Nails: Wet n Wild Cougar Attack! Today I have another winner from the Wet n Wild On The Prowl collection, Wet n Wild Cougar Attack. Love the name!! On The Prowl has started to show up at Ulta locations, so hopefully you may still be able to find this elusive collection. If you do, I suggest buying the whole thing. It's really excellent! I have seen Cougar Attack described as a black jelly with orange glitter (like Sally Hansen Pumpkin Spice), but in person it looks like a dark chocolate brown jelly with copper/peach glitter. It definitely looks totally different than Pumpkin Spice. For one thing, it's much more pigmented and easier to wear alone. This is three coats of Cougar Attack all by itself. For another thing, the base color and glitter color are different than Pumpkin Spice. I think you should own both!! LOL. This is a really delicious combination of colors. I absolutely love this. 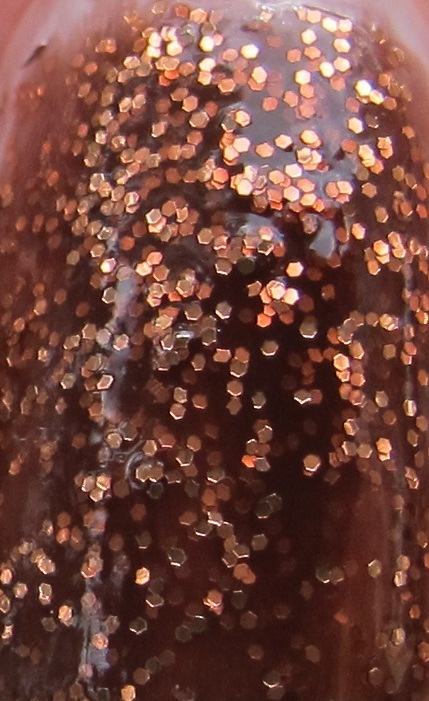 Check out this macro shot below to get the full effect. See how the glitter isn't straight up orange? It's more of a peachy copper. Lovely! I am wearing this as a full mani right now, I just couldn't bear to take this beauty off. This is my favorite of the On The Prowl collection, although I haven't worn Correction Tape yet! 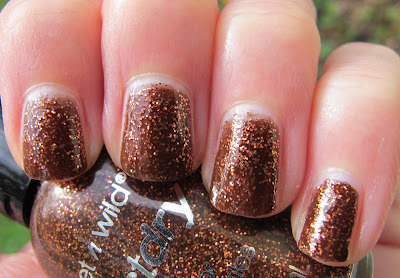 Wet n Wild On The Prowl has been difficult to locate, but Nouveau Cheap has a map on her blog indicating where the collection has been spotted. Peace, Love and Polish- that it is! And a good one too!! Imfeelingnail-venturous- me too! Have you found On The Prowl anywhere? This looks like an interesting polish. I may have to go try to find it!